Loyally accompanying a mysterious knife-wielding gentleman named Jack on his midnight rounds through the murky streets of London, good dog Snuff is busy helping his master collect the grisly ingredients needed for an unearthly rite that will take place not long after the death of the moon. But Snuff and his master are not alone. All manner of participants, both human and not, are gathering with their ancient tools and their animal familiars in preparation for the dread night. It is brave, devoted Snuff who must calculate the patterns of the Game and keep track of the Players—the witch, the mad monk, the vengeful vicar, the Count who sleeps by day, the Good Doctor and the hulking Experiment Man he fashioned from human body parts, and a wild-card American named Larry Talbot—all the while keeping Things at bay and staying a leap ahead of the Great Detective, who knows quite a bit more than he lets on. Boldly original and wildly entertaining, A Night in the Lonesome October is a darkly sparkling gem, an amalgam of horror, humor, mystery, and fantasy. 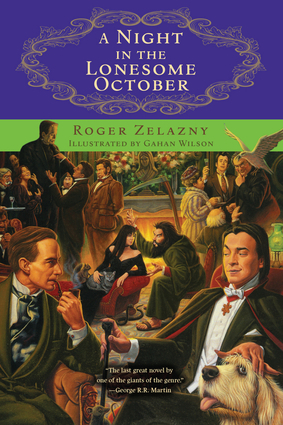 First published in 1993, it was Zelazny's last book prior to his untimely death. Many consider it the best of the fantasy master's novels. It has inspired many fans to read it every year in October, a chapter a day, and served as inspiration for Neil Gaiman's brilliant story "Only the End of the World Again."